On the evening of Saturday, November 26, 1898, New England was struck by the most destructive storm the region had ever experienced. The gale killed over 200 persons and wrecked or sank at least 140 major vessels. 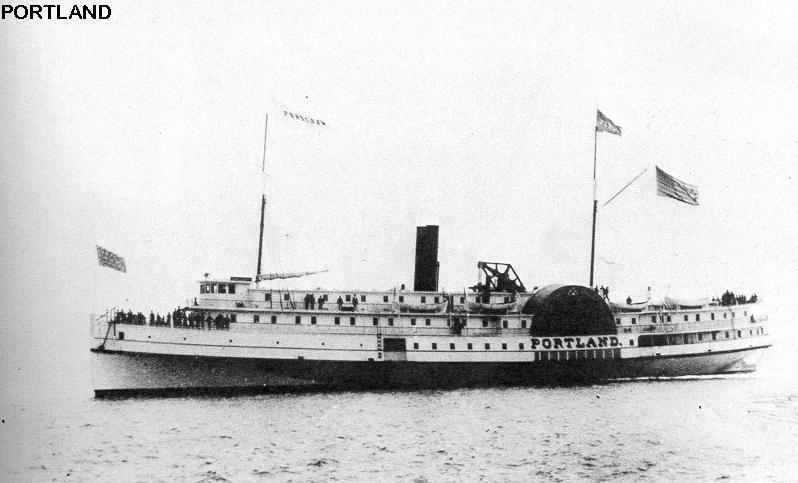 The best-known victim of the gale was the coastal steamer Portland, lost off Cape Cod with 191 people aboard. The steamer gave her name to the storm, and has since been memorialized in New England folklore and legend. This photo feature looks at the ships and events of that terrible storm, on the occasion of the 100th anniversary of the event. The storm started quietly on the evening of the 26th of November, with a light but strengthening wind. Within hours it had grown to hurricane proportions and was creating havoc all along the coast. The winds raged all through the night of the 26th, all day on the 27th, and did not subside until the 28th, some 36 hours after the storm had started. Winds were clocked at up to 72 mph in Boston, and were probably even stronger along the coast southeast of Boston, especially on Cape Cod. To call the damage widespread is a vast understatement. 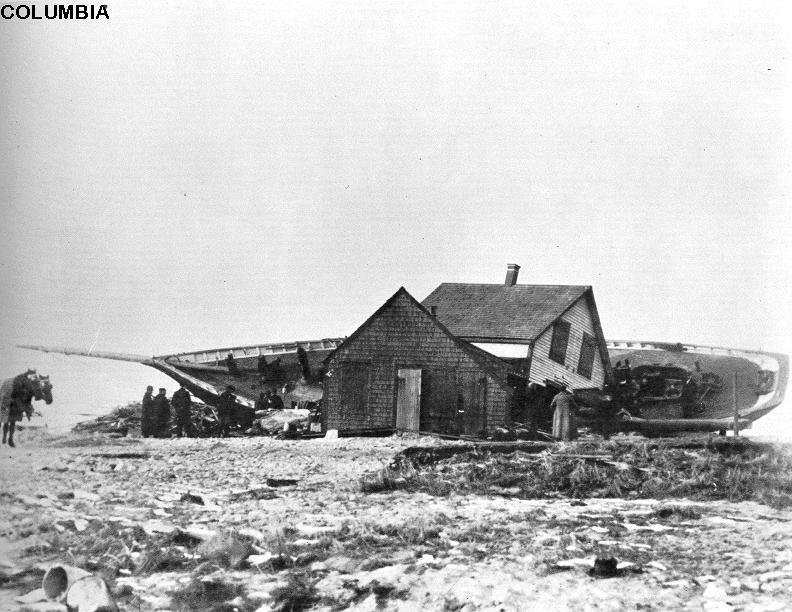 Houses were blown over and washed away all along the coast from Cape Cod to Portland, Maine. The coastline was littered with the wrecks and wreckage of dozens of vessels, large and small, smashed or sunk by the fierce winds and seas. In Provincetown harbor alone over 30 vessels were blown ashore or sunk. Damage along Boston's south shore and Cape Cod was probably the worst; telegraph lines were brought down, railways washed out, and even the low scrub trees of Cape Cod were blown away. In Scituate, a small coastal community 30 miles south of Boston, the coastline was permanently altered when mountainous waves cut a new inlet from the sea to the North River, closed the old river mouth, and reversed the flow of part of the river. The steamer Portland at sea. Portland, built at Bath, Maine in 1889 for the Boston-Portland run, was the pride of the New England coastal steamer fleet. She was strongly built, outfitted with the finest furnishings, and was run by an excellent crew. However, like the other big sidewheel steamers popular in the late 1800's and early 1900's, her long, shallow wooden hull and massive overhanging sponsons (housing her paddlewheels) made her vulnerable to rough seas. Portland departed Boston for the final time at 7 PM on November 26, 1898, crowded with passengers returning home after the Thangsgiving holiday. At the time of her departure the weather was worsening, but had not yet deteriorated to the point that sailing was deemed inadvisable. As she steamed northeast towards Portland, however, conditions quickly worsened. At 9:30 PM she was sighted passing Thatcher's Island, a short distance northeast of Boston, her progress clearly hampered by the deteriorating weather. Although she was still making headway against the storm at this sighting, she probably did not get far before her progress was stopped. Between 11 and 11:45 PM Portland was sighted three times, but this time to the southeast of Thatcher's Island - she was being driven south by the storm. When sighted at 11:45 PM, she is said to have shown severe storm damage, especially to the superstructure. By this time conditions on the steamer must have been dreadful, and all aboard must have known they were in grave danger. Unable to make progress against the storm and unable to make for safe port, Portland's only hope lay in working her way offshore and riding out the storm at sea. Her attempts to reach the open sea accounted for her slow movement to the east between the 9:30 and 11:45 sightings. At 5:45 AM the following morning, lifesavers on Cape Cod heard four blasts of a steamer's whistle. It is now believed the whistle was that of the doomed Portland. In the course of the night the storm had driven her even further backwards, so she was now far southeast of Boston. Between 9:00 and 10:30 that morning the eye of the storm passed over, and several persons claim to have seen Portland wallowing five to eight miles offshore, clearly in great peril. No further sightings were made that day, as the storm closed in once again. At 7:30 that night, more than 24 hours after Portland had sailed, a lifesaver on his regular beach patrol found one of the steamer's lifebelts washed up on the beach. Fifteen minutes later several fourty-quart dairy cans were found in the surf. At 9:30 doors and woodwoork from Portland were found. Around 11:00 the rising tide brought in massive quantities of wreckage, giving clear evidence that Portland had been lost. It is said that this tragic news was communicated to the world via a bizarre relay - by telegraph across the trans-Atlantic cable to France, then to New York via another undersea cable, and from there on to Boston - for the telegraph cables between Cape Cod and Boston had been blown away by the storm. All those aboard Portland, believed to be a total of 191 passengers and crew (the only passenger list was lost with the ship), were killed. Eventually 36 bodies were recovered along the beaches. Many of the bodies wore wristwatches that had stopped at 9:15. It is unclear, however, if this indicates the ship was lost at 9:15 AM, or at 9:15 PM. Although there are several reports of the ship being sighted, afloat, between 9 AM and 10:30 AM that day, the exact times of those sightings are not known. If any of those sightings took place after 9:15 AM, then the ship must have survived until 9:15 PM that day, some 26 hours and 15 minutes after she had started her doomed voyage. However, Portland would not have carried enough fuel to remain at sea, in storm conditions, for over 24 hours. She could have burned furnishings, interior bulkheads, and other wooden materials to keep the boilers running, but the quantity of this material washed ashore tends to indicate this action was not taken. Also, it is highly questionable whether she could have held together for 24 hours, given the terrible sea conditions. Still, the fact that major debris did not begin to wash ashore until 9:30 PM suggests that Portland had survived into the night - surely, if she had been wrecked at 9:15 AM, debris would have been washed ashore in the morning. Because the exact time of the final sightings cannot be firmly established, it is impossible to conclusively determine the exact time of Portland's loss - either 9:15 AM, or 9:15 PM, on Sunday, November 27, 1898. Portland's remains were eventually located on the seafloor about seven miles offshore, and have since been explored. The small schooner Addie E. Snow was also lost during the storm, and her remains lie less than 1/4 mile from Portland's grave. It is thought that the two vessels may have collided, hastening their ends. The tragedy of the Portland was deeply felt in the New England seafaring community, and lead to many changes. Most significantly, the adoption of steel-hulled, propeller-driven steamers was greatly hastened, especially on the rugged "outside" or "Down-east" runs. The sidewheel steamers lasted for many more decades, but increasingly on "inside", or protected, runs. Although this photo does not show the aftermath of the 1898 gale, it does illustrate the damage a sidewheel steamer could suffer in rough weather. 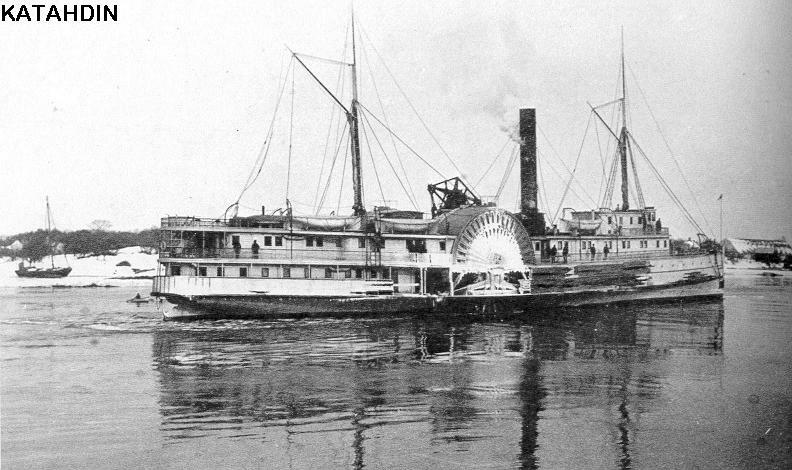 This is the steamer Katahdin, one of the best-known and longest-lived New England steamers. 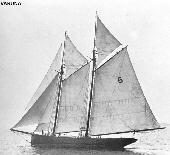 On the night of January 9, 1886, while en route from Boston to Bangor, she was caught by a fierce gale. She managed to stay offshore, clear of perilous shoals and surf, but she still suffered terribly. Katahdin battled high seas for 10 hours, and in the process burned her entire coal supply. To keep her engines and pumps running it was necessary to feed the hungry boilers whatever fuel could be found, including all the ship's furniture, cargo, and non-structural bulkheads. The fuel situation was so desparate that even a shipment of hams was considered worthwhile fuel! Katahdin is seen here limping into Portsmouth, New Hampshire, the morning after the gale. Although badly battered and many miles short of her desination, she has at least survived the storm, and will be repaired. 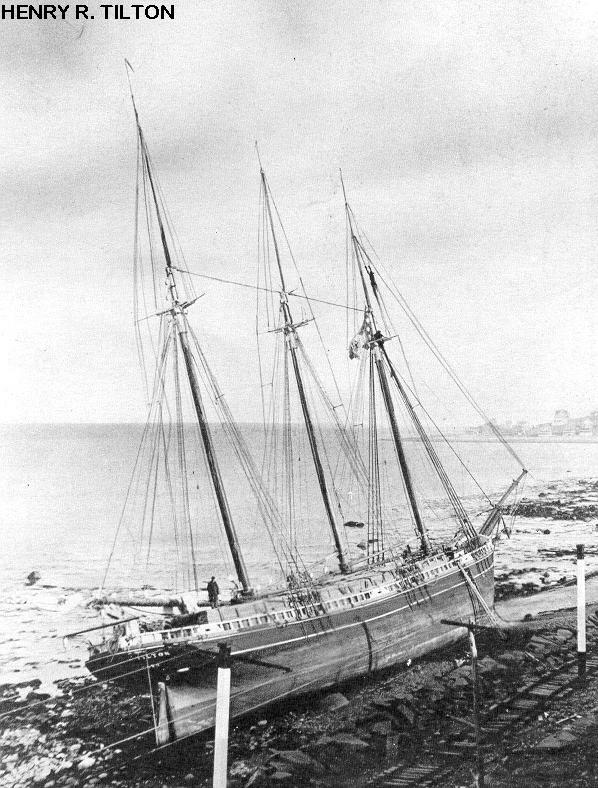 The schooner Henry R. Tilton wrecked at Toddy Rocks, Hull, Massachusetts. This ship picked a fortunate spot on the beach, landing only 1 1/2 miles from the Point Allerton Lifesaving Station. The lifesavers, lead by famous Captain Joshua James, hastened to the scene and brought her crew of seven off by breeches buoy. The schooner was eventually hauled off the beach, repaired, and returned to service. She was lost off Cape Cod in 1912. 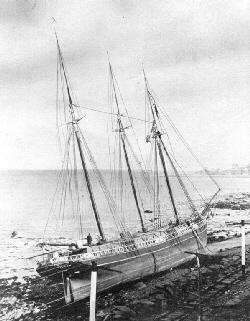 The pilot schooner Columbia wrecked at Scituate. The schooner was returning to Boston on the afternoon of the 26th of November, having put her last pilot aboard a steamer at noon that day. She was sighted near Boston Lightship around dusk, lying becalmed. Then the storm struck, and she apparently put about in an attempt to get offshore to ride out the storm. This attempted failed and she had no choice but to anchor. Both anchor chains parted, and she was driven ashore here in Scituate, smashing a cottage. Her crew of five was lost; only three bodies were recovered. The schooner was a total loss, her starboard side badly stove. The hull was sold where it lay for $300, and was eventually burnt. 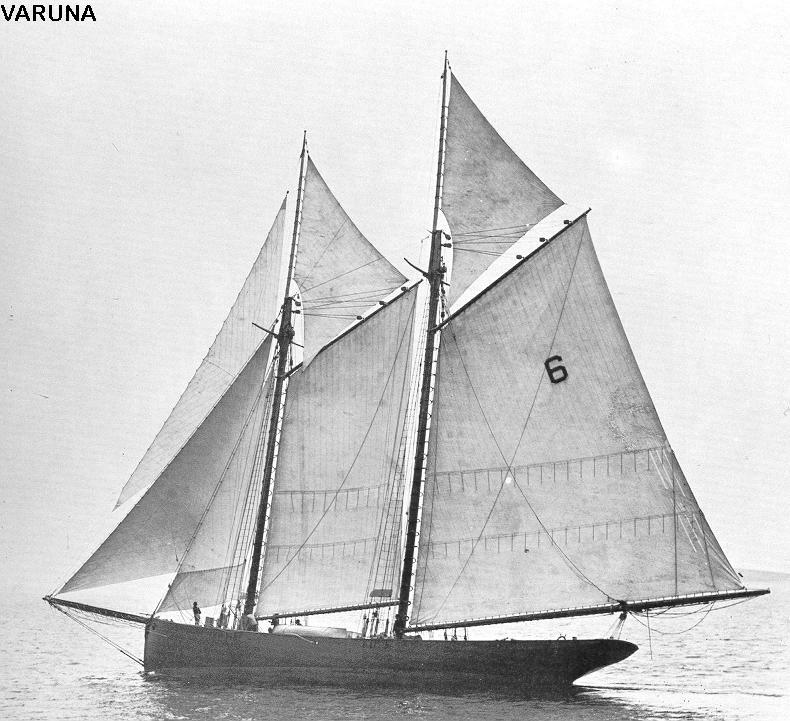 One of the lucky survivors - the pilot schooner Varuna. This schooner had just departed Boston when the storm struck. She managed to get offshore to ride out the storm, although she barely cleared the shoals of Cape Cod. The next morning a large quantity of sand was found aboard, apparently scooped up by the seas and deposited on her decks as she passed through shoal waters. The fishing schooner Juniata was another victim of the gale. 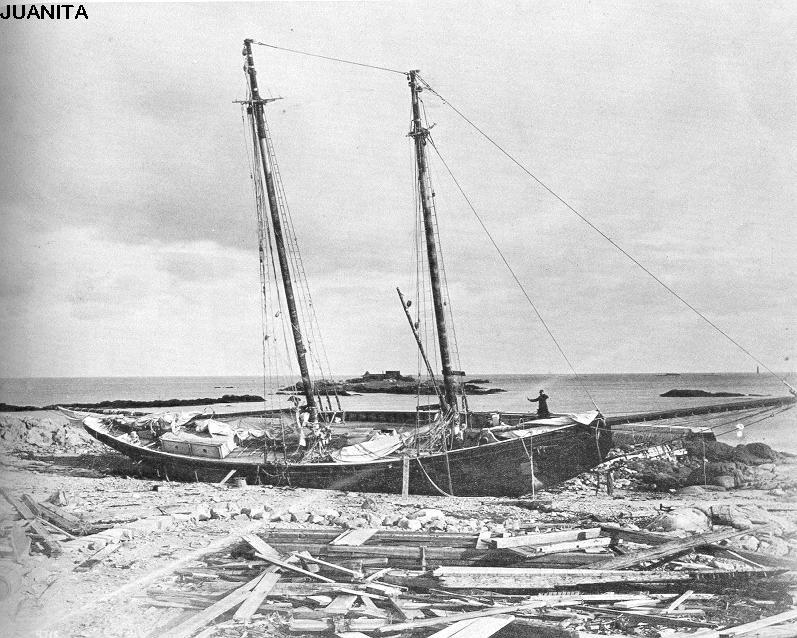 This vessel, less than a year old, was blown ashore at Cohasset, Massachusetts. Her crew escaped in the dories; all survived. The schooner was later salvaged. 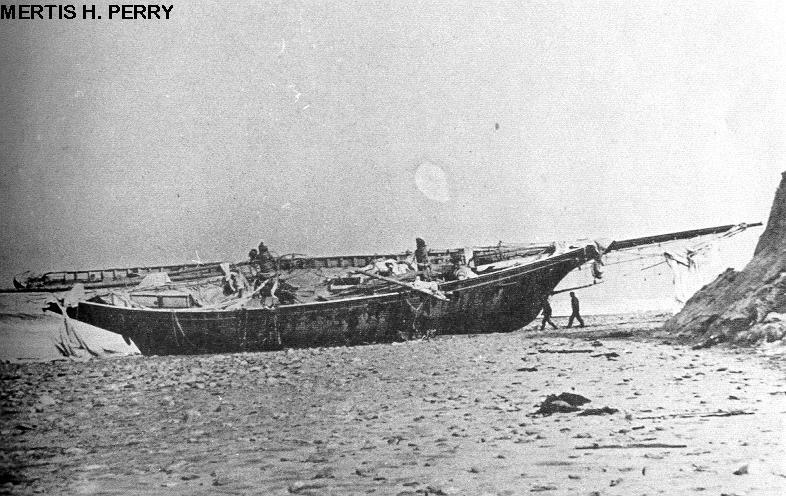 The Mertis H. Perry wrecked at Marshfield, Mass. This fishing schooner was thrown ashore on the morning of November 27th. Five of her crew of 14 were washed overboard and lost, but the survivors crawled ashore by way of her bowsprit and found shelter in a nearby farmhouse. Although she was wrecked only two miles from the Brant Rock Life Saving Station, the storm conditions prevented her discovery by the lifesavers until mid-afternoon of the 27th. Perry was a total loss. 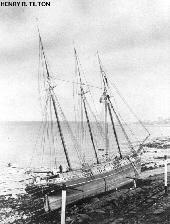 The three masted schooner Albert L. Butler wrecked at Peaked Hill Bars, Provincetown, Mass. Lifesavers brought five men safely off the wrecked ship, but three other men were lost. The schooner was a total loss. This part of Cape Cod is a particularly treacherous area, and many ships have been lost here. Although damage was most severe in New England, it extended to other regions as well. The four-masted schooner barge Independent was blown ashore at Riverhead, Long Island, New York. Like the more glamorous Portland, this barge had been built at Bath, Maine in 1889. 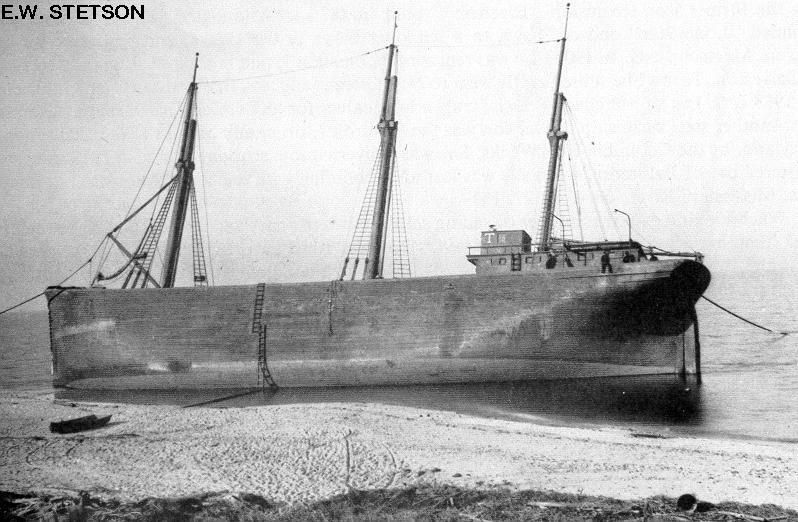 She was one of the largest barges of her time. 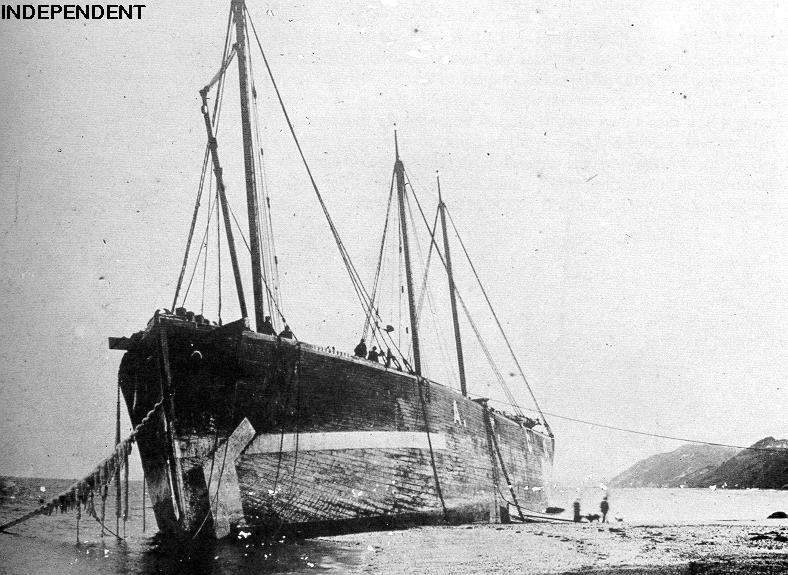 Independent was hauled off and repaired, lasting another decade until she sank on November 14, 1908. 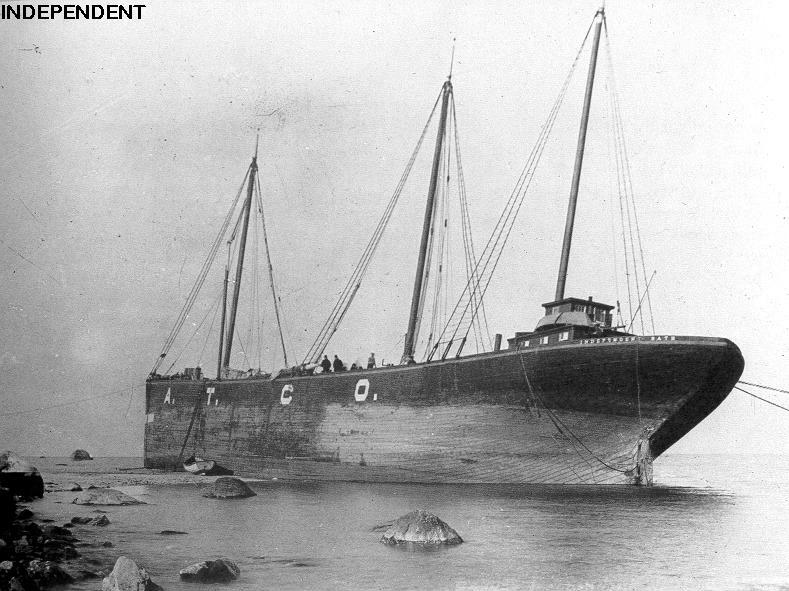 Another view of the beached Independent. 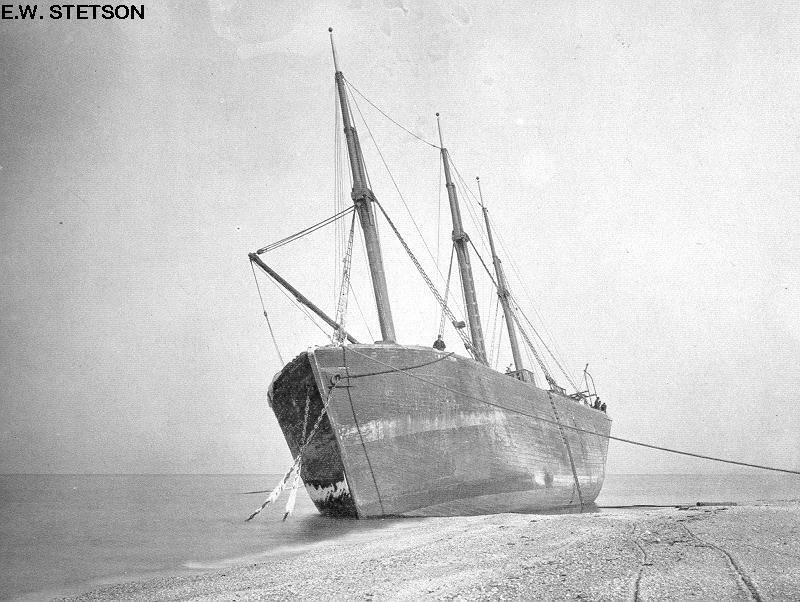 The three masted schooner barge E. W. Stetson was wrecked at Jamesport, Long Island. This vessel was quite elderly by this time, having been launched at Newcastle, Maine in 1862 as a full rigged ship. Like many older sailing ships, she was cut down to a schooner barge to haul coal along the east coast. This vessel was also hauled off and repaired, and lasted until 1911. A second view of E. W. Stetson. 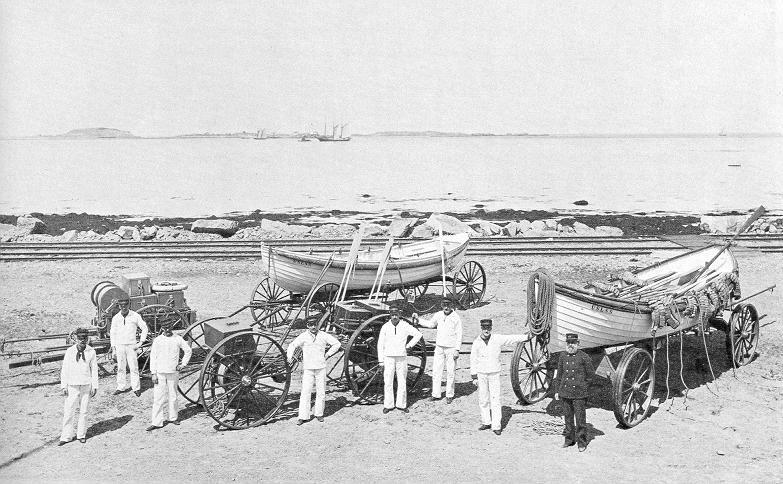 The famous lifesaving crew of the Point Allerton Life Saving Station, led by Captain Joshua James. Here this crew and their legendary leader will represent the numerous lifesaving crews who made heroic rescues during the Portland Gale. Without the selfless efforts of livesavers all along the coast, the death toll from this storm surely would have been much higher. 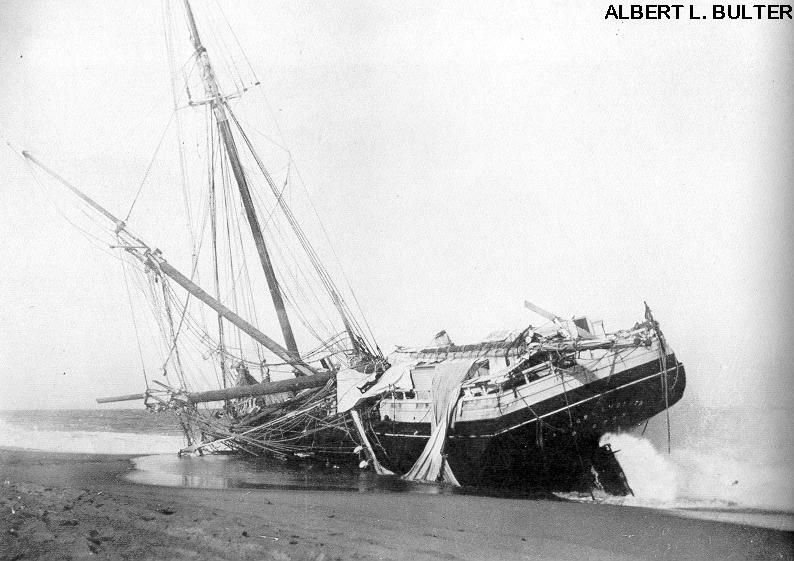 The Point Allerton crew alone rescued 20 people from six vessels during the storm, despite seas so high that their surfboats could not be launched from the beaches. For more about these heroic men, see The Lifesavers photo feature.